Empty Gas Tank Forces Dad To Deliver Baby in Sam's Club Parking Lot! Home » Empty Gas Tank Forces Dad To Deliver Baby in Sam’s Club Parking Lot! When labour is on the horizon, there are a few things you need to do to ensure you are ready ~ pre-pack your bag, install the infant seat and make sure that you car has enough GAS in it to get to the hospital. Josephine and Fritz Rosales likely did the first two, but found out after Josephine was in labour that the third piece of the puzzle was empty. So when Josephine’s water broke on Friday night they needed to make a quick stop at the gas station, which then put them behind a 90-car freight train. But just when the end of the train was in sight, a train coming from the other direction appeared. With no where else to go Fritz pulled into a nearby Sam’s Club and called 911. 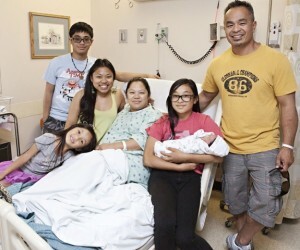 Before paramedics could arrive, however, Alexandre Miguel Rosales made his entrance into the world. “She pushed really hard, and the baby squirted out,” he said. The delivery took all of 60 seconds.